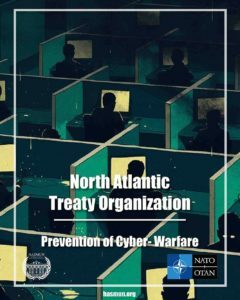 The North Atlantic Treaty Organization, established in 1949, is a military alliance founded after World War Two in order to promote collective defense and security. NATO has been active in many regions around the world, including the Balkans, Middle East, and Afghanistan. The Organization is run by the North Atlantic Council (NAC) and the member states are represented through high-ranking diplomats and heads of state. This year’s assembly will be considered a summit, and as a result, the delegates will be representing heads of state and government, and the meeting will be chaired by the Secretary-General. In this year’s meeting, the council will be discussing the issue of cyber security. There have been many peculiar incidents regarding the subject, most notably the 2016 election in the United States (which is still under investigation) and the recent developments in Germany (which caused the accounts of several officials to be compromised). NATO has also made big investments into the field in 2018. Moreover, the establishment of a new cyber-command that would be fully-operational in 2023 was agreed upon. How much NATO is invested into the field, coupled with the recent international developments will make for very interesting debates.